Since the holidays started back in October (yes, there are that do include Halloween as a holiday), it can be a huge sacrifice to stay away from indulging in the holiday festivities. I always feel like I have gained 100 pounds when one holiday ends and another one starts. I am sure many of you feel the same way. For me, this is especially true for this holiday season when I an not in my usual exercise routine. 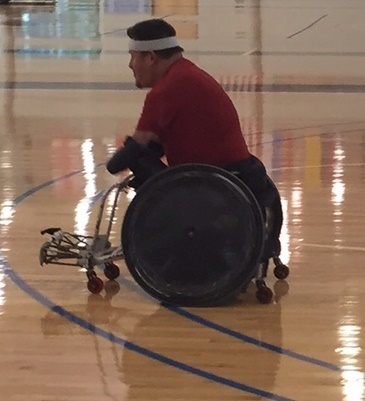 The wheelchair rugby season post season will start in the about one month. In the past I usually wait until after the holiday season to begin working out, but not this year. I have already worked out three times during the Christmas break. Now, with the rugby season going longer this year than last year, I have to be care not to peak to early or even get burned out from training. In the past, I have usually waited to begin training with the rugby team, however, this year I will have to even more training during the holidays. (Not everyone is excited about exercising during the holidays). I need to start something new. So, I will not waiting until the holiday season ends, I will start training during the holiday season. Last year, for the first time ever, I did a Cross-fit exercise. I loved them so much that I plan to do more this holiday season. However, the issue I have with cross-fit is that I can only do it once a week because it is such a physically demanding workout. I have been advised that I can only do a cross-fit workout once a week out of fear of over using my biceps and triceps. It is not that easy finding fresh new work outs for a quad amputee. I still continue with core class going twice a week during the winter and spring. These classes are perfect for me! Many of these exercises can be time consuming for endurance. Many are short because the focus is on intensity. Also, the core class exercises are idea for preparing me for an extreme interval exercise. Since I am only able to do extreme interval exercises once a week, it sure helps to have other alternatives. The core class is perfect in that regard. I will start back slowly then increase to my extreme interval exercises. The purpose of my extreme interval exercises is to really push my intensity level. The multiple stations allow me to work multiple muscle groups at a very intense level. I am usually worn out after just 10 minutes. But I love it. Once I get my routine and schedule set for the remainder of the winter, I will look to add other activities such as swimming and maybe a 5k. I will soon be in good enough shape as the rugby post season begins next month. What are you doing for exercise during the holidays?